Reviewing projects for the VTA budget, the Capital Programs Committee saw some eye-opening data about the cost and expected performance of some of the very long-planned projects on the books. The statistics for the Vasona Light Rail project are shocking. The two stations that are proposed in the extension are expected to have a total of 717 net new riders by 2035, with an estimated cost of about $400M. The cost would be an eye-opening $650,000 per new daily rider. Earlier in the project’s history, there were plans for transit-oriented development near the Hacienda station, but those plans were halted by Campbell City Council. Much of the area around the line is zoned for single-family houses, and that is not expected to change. The statistics for the Eastridge Light Rail Extension are slightly less bad. The extension is expected to garner 1316 new riders for a price tag about $600M, at a cost of $456,000 per new daily rider. Unlike the Vasona line, the Eastridge line would travel on a route that has one of the county’s higher ridership bus lines, which is part of the “frequent network” in the upcoming system change. And it serves a lower-income area with many transit-dependent riders. 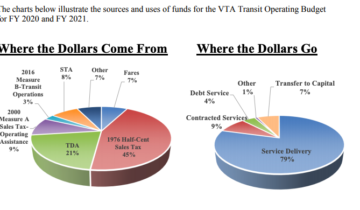 But VTA’s own numbers show that this project is not a cost-effective way to provide better service. For both light rail extension projects, cost per rider is an order of magnitude higher than good projects in the US, which tends to overpay for transit, 5 times higher than mediocre projects in the US, and 20 to 50 times higher than good projects in Europe. Good US rail projects cost much more than projects in Europe. According to Levy, Boston’s Green Line light rail extension is projected to get 52,000 daily riders, making it about $45,000 per rider as well. Los Angeles’ Purple Line is expected to carry 150,000 riders across its three phases, which will come out to about $45,000 per rider. Levy reports that many American light-rail lines have per-rider costs approaching $100,000. These VTA light rail extensions are expected to cost 4-6x more per rider than projects even by typical US standards of high costs. Currently, VTA is struggling with structural budget gaps, and is having trouble funding the service that it already provides. VTA just decided to end service on the Almaden light rail line serving the Ohlone/Chynoweth, Oakridge and Almaden, which was serving about 600 riders. Also, to close a budget gap, VTA also just decided to pare back planned service per capita. Since VTA is struggling to fund low-ridership services, it would be tragic folly to go ahead to build new extensions that will have low ridership and that it can’t afford to operate. Proponents make the case that voters twenty years ago voted for these projects, and so VTA owes it to voters to deliver as promised. But if twenty years ago, voters had known that the VTA light rail system would rank 30th out of 39 light rail systems in the country in terms of ridership per mile, would they have voted for the projects? The recipe for successful transit – in the few places in North America where transit is holding its own in an area of cheap gas, Lyft and Uber – is to provide frequent service on a grid of corridors with many potential riders, and to invest in speeding up transit to be more competitive with driving. Speeding up transit also makes it more cost-effective to run because more passengers can be served with the same number of service dollars. Thanks to some good thinking about the budget and how to provide a competitive service, VTA is now analyzing and planning to prioritize transit speed projects. 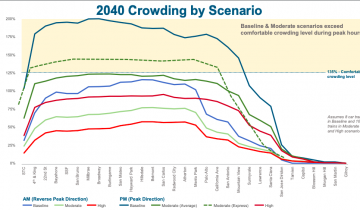 VTA is currently in the process of analyzing a set of corridors for potential rapid transit routes that may be a better fit for today’s world – unlike these projects, and unlike the redundant BART segment from Diridon to Santa Clara which would parallel a segment of the Caltrain line which won’t be full even in 2040. Change will be painful, but the numbers tell a painful truth. Do you agree? Should VTA update its decades-old transit projects with projects that are a better fit for today’s needs? If you agree, there are upcoming opportunities to comment on VTA’s budget. There is a budget workshop on April 19 at 9am, and committee meetings in May, before the budget is adopted by the board in June. You can send thoughts to board.secretary@vta.org, and feel free to copy us at friends@friendsofcaltrain.com Also, if you are interested in scrutinizing highway projects that may have outlived their usefulness and compatibility with the county’s climate goals, let us know. 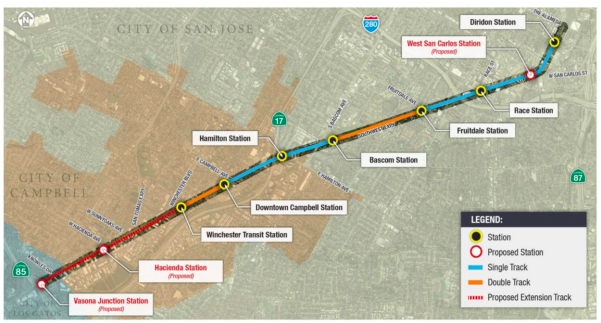 If that extension would go to Downtown Los Gatos, I could get behind it, but otherwise reminds me of Central Subway that doesn’t go to North Beach. Punch that sucka through to Santa Cruz. In all seriousness, upzone around the light rail stations and watch it succeed. Why the f**k is nothing in downtown Campbell taller than 2 stories, for example? Why is California so allergic to buildings taller than that? The whole area should be targeting build out at 6-10 stories.